House Speaker John Boehner (R-OH) issued the following the statement in response to President Obama’s comments today regarding the debt limit. In addition to questions on the so-called debt ceiling, the President also talked about preventing gun violence and the need for bipartisan compromise to reduce our deficit in a balanced and responsible way. You can watch the entire press conference here. It’s been a busy and productive four years. And I expect the same for the next four years. I intend to carry out the agenda that I campaigned on — an agenda for new jobs, new opportunity, and new security for the middle class. Right now, our economy is growing, and our businesses are creating new jobs, so we are poised for a good year if we make smart decisions and sound investments — and as long as Washington politics don’t get in the way of America’s progress. As I said on the campaign, one component to growing our economy and broadening opportunity for the middle class is shrinking our deficits in a balanced and responsible way. And for nearly two years now, I’ve been fighting for such a plan — one that would reduce our deficits by $4 trillion over the next decade, which would stabilize our debt and our deficit in a sustainable way for the next decade. That would be enough not only to stop the growth of our debt relative to the size of our economy, but it would make it manageable so it doesn’t crowd out the investments we need to make in people and education and job training and science and medical research — all the things that help us grow. Now, step by step, we’ve made progress towards that goal. Over the past two years, I’ve signed into law about $1.4 trillion in spending cuts. Two weeks ago, I signed into law more than $600 billion in new revenue by making sure the wealthiest Americans begin to pay their fair share. When you add the money that we’ll save in interest payments on the debt, all together that adds up to a total of about $2.5 trillion in deficit reduction over the past two years — not counting the $400 billion already saved from winding down the wars in Iraq and Afghanistan. So we’ve made progress. We are moving towards our ultimate goal of getting to a $4 trillion reduction. And there will be more deficit reduction when Congress decides what to do about the $1.2 trillion in automatic spending cuts that have been pushed off until next month. The fact is, though, we can’t finish the job of deficit reduction through spending cuts alone. The cuts we’ve already made to priorities other than Medicare, Medicaid, Social Security and defense mean that we spend on everything from education to public safety less as a share of our economy than it has — than has been true for a generation. And that’s not a recipe for growth. That’s what I want as well. That’s what I’ve proposed. And we can get it done, but we’re going to have to make sure that people are looking at this in a responsible way rather than just through the lens of politics. Now, the other congressionally imposed deadline coming up is the so-called debt ceiling — something most Americans hadn’t even heard of before two years ago. I want to be clear about this. The debt ceiling is not a question of authorizing more spending. Raising the debt ceiling does not authorize more spending. It simply allows the country to pay for spending that Congress has already committed to. These are bills that have already been racked up and we need to pay them. So let’s finish this debate. Let’s give our businesses and the world the certainty that our economy and our reputation are still second to none. We pay our bills. We handle our business. And then we can move on — because America has a lot to do. We’ve got to create more jobs. We’ve got to boost the wages of those who have work. We’ve got to reach for energy independence. We’ve got to reform our immigration system. We’ve got to give our children the best education possible, and we’ve got to do everything we can to protect them from the horrors of gun violence. And let me say I’m grateful to Vice President Biden for his work on this issue of gun violence and for his proposals, which I’m going to be reviewing today and I will address in the next few days and I intend to vigorously pursue. So, with that, I’m going to take some questions. And I’m going to start with Julie Pace of AP. And I want to congratulate Julie for this new, important job. Q I wanted to ask about gun violence. Today marks the one-year — or one-month anniversary of the shooting in Newtown, which seemed to generate some momentum for reinstating the assault weapons ban. But there’s been fresh opposition to that ban from the NRA. And even Harry Reid has said that he questions whether it could pass Congress. Given that, how hard will you push for an assault weapons ban? And if one cannot pass Congress, what other measures would need to be included in a broad package in order to curb gun violence successfully? THE PRESIDENT: Well, as I said, the Vice President and a number of members of my Cabinet went through a very thorough process over the last month, meeting with a lot of stakeholders in this including the NRA, listened to proposals from all quarters, and they’ve presented me now with a list of sensible, common-sense steps that can be taken to make sure that the kinds of violence we saw at Newtown doesn’t happen again. And then members of Congress I think are going to have to have a debate and examine their own conscience — because if, in fact — and I believe this is true — everybody across party lines was as deeply moved and saddened as I was by what happened in Newtown, then we’re going to have to vote based on what we think is best. We’re going to have to come up with answers that set politics aside. And that’s what I expect Congress to do. But what you can count is, is that the things that I’ve said in the past — the belief that we have to have stronger background checks, that we can do a much better job in terms of keeping these magazine clips with high capacity out of the hands of folks who shouldn’t have them, an assault weapons ban that is meaningful — that those are things I continue to believe make sense. Will all of them get through this Congress? I don’t know. But what’s uppermost in my mind is making sure that I’m honest with the American people and with members of Congress about what I think will work, what I think is something that will make a difference. And to repeat what I’ve said earlier — if there is a step we can take that will save even one child from what happened in Newtown, we should take that step. Q Thank you, sir. As you know, the Senate Democrats, Harry Reid sent you a letter begging you, essentially, to take — consider some sort of executive action on this debt ceiling issue. I know you’ve said you’re not negotiating on it. Your administration has ruled out the various ideas that have been out there — the 14th Amendment. But just this morning, one of the House Democratic leaders, Jim Clyburn, asked you to use the 14th Amendment and even said, sometimes that’s what it takes. He brought up the Emancipation Proclamation as saying it took executive action when Congress wouldn’t act, and he compared the debt ceiling to that. So are you considering a plan B, and if not, why not? Separately, they also have to authorize the raising of the debt ceiling in order to make sure that those bills are paid. And so, what Congress can’t do is tell me to spend X, and then say, but we’re not going to give you the authority to go ahead and pay the bills. And I just want to repeat — because I think sometimes the American people, understandably, aren’t following all the debates here in Washington — raising the debt ceiling does not authorize us to spend more. All it does is say that America will pay its bills. And we are not a dead-beat nation. And the consequences of us not paying our bills, as I outlined in my opening statement, would be disastrous. So I understand the impulse to try to get around this in a simple way. But there’s one way to get around this. There’s one way to deal with it. And that is for Congress to authorize me to pay for those items of spending that they have already authorized. And the notion that Republicans in the House, or maybe some Republicans in the Senate, would suggest that “in order for us to get our way on our spending priorities, that we would risk the full faith and credit of the United States” — that I think is not what the Founders intended. That’s not how I think most Americans think our democracy should work. They’ve got a point of view; Democrats in Congress have a point of view. They need to sit down and work out a compromise. Q You just outlined an entire rationale for why this can’t happen. Q And if — then if — and you’re not negotiating on the debt ceiling. Q So you’re not negotiating and they say you have to negotiate, and you’re not considering another plan B, then do you just wait it out and we do go — we do see all these things happen? THE PRESIDENT: Well look, Chuck, there are — there’s a pretty straightforward way of doing this and that is to set the debt ceiling aside, we pay our bills, and then we have a vigorous debate about how we’re going to do further deficit reduction in a balanced way. Keep in mind that what we’ve heard from some Republicans in both the House and the Senate is that they will only increase the debt ceiling by the amount of spending cuts that they’re able to push through and — in order to replace the automatic spending cuts of the sequester — that’s $1.2 trillion. Say it takes another trillion or trillion-two to get us through one more year, they’d have to identify $2.5 trillion in cuts just to get the debt ceiling extended to next year — $2.5 trillion. They can’t even — Congress has not been able to identify $1.2 trillion in cuts that they’re happy with. Because these same Republicans say they don’t want to cut defense; they’ve claimed that they don’t want to gut Medicare or harm the vulnerable. But the truth of the matter is that you can’t meet their own criteria without drastically cutting Medicare, or having an impact on Medicaid, or affecting our defense spending. So the math just doesn’t add up. Now, here’s what would work. What would work would be for us to say we’ve already done close to $2 trillion in deficit reduction, and if you add the interest that we won’t be paying because of less spending and increased revenue, it adds up to about $2.5 trillion. The consensus is we need about $4 trillion to stabilize our debt and our deficit, which means we need about $1.5 trillion more. The package that I offered to Speaker Boehner before we — before the New Year would achieve that. We were actually fairly close in terms of arriving at that number. So if the goal is to make sure that we are being responsible about our debt and our deficit, if that’s the conversation we’re having, I’m happy to have that conversation. And by closing some additional loopholes through tax reform — which Speaker Boehner has acknowledged can raise money in a sensible way — and by doing some additional cuts, including making sure that we are reducing our health care spending, which is the main driver of our deficits, we can arrive at a package that gets this thing done. I’m happy to have that conversation. What I will not do is to have that negotiation with a gun at the head of the American people — the threat that “unless we get our way, unless you gut Medicare or Medicaid, or otherwise slash things that the American people don’t believe should be slashed, that we’re going to threaten to wreck the entire economy.” That is not how historically this has been done. That’s not how we’re going to do it this time. Everybody here understands this. I mean, this is not a complicated concept. You don’t go out to dinner and then eat all you want, and then leave without paying the check. And if you do, you’re breaking the law. And Congress should think about it the same way that the American people do. You don’t — now, if Congress wants to have a debate about maybe we shouldn’t go out to dinner next time, maybe we should go to a more modest restaurant, that’s fine. That’s a debate that we should have. But you don’t say, in order for me to control my appetites, I’m going to not pay the people who already provided me services, people who already lent me the money. That’s not showing any discipline. All that’s doing is not meeting your obligations. You can’t do that. You, yourself, as a member of the Senate, voted against a debt ceiling increase. And in previous aspects of American history — President Reagan in 1985, President George Herbert Walker Bush in 1990, President Clinton in 1997 — all signed deficit reduction deals that were contingent upon or in the context of raising the debt ceiling. You, yourself, four times have done that. Three times, those were related to deficit reduction or budget maneuvers. But what you’ve never seen is the notion that has been presented, so far at least, by the Republicans that deficit reduction — we’ll only count spending cuts; that we will raise the deficit — or the debt ceiling dollar for dollar on spending cuts. There are a whole set of rules that have been established that are impossible to meet without doing severe damage to the economy. Q (Inaudible) — open to a one-to-three-month extension to the debt ceiling — whatever Congress sends you, you’re okay with it? THE PRESIDENT: — and we shouldn’t be doing this on a one to three-month timeframe. Why would we do that? This is the United States of America, Major. What, we can’t manage our affairs in such a way that we pay our bills and we provide some certainty in terms of how we pay our bills? And despite that conversation, and despite the election results, the position that’s been taken on the part of some House Republicans is that, “no, we’ve got to do it our way, and if we don’t, we simply won’t pay America’s bills.” Well, that can’t be a position that is sustainable over time. It’s not one that’s good for the economy now. It’s certainly not going to be the kind of precedent that I want to establish not just for my presidency, but for future Presidents, even if it was on the other side. Democrats don’t like voting for the debt ceiling when a Republican is President, and yet you — but you never saw a situation in which Democrats suggested somehow that we would go ahead and default if we didn’t get 100 percent of our way. That’s just not how it’s supposed to work. Q Thank you, Mr. President. On the issue of guns, given how difficult it will be — some would say impossible — to get any gun control measure passed through this Congress, what are you willing or able to do, using the powers of your presidency, to act without Congress? And I’d also like to know, what do you make of these long lines we’re seeing at gun shows and gun stores all around the country? I mean, even in Connecticut, applications for guns are up since the shooting in Newtown. THE PRESIDENT: Well, my understanding is the Vice President is going to provide a range of steps that we can take to reduce gun violence. Some of them will require legislation. Some of them I can accomplish through executive action. And so I’ll be reviewing those today. And as I said, I’ll speak in more detail to what we’re going to go ahead and propose later in the week. But I’m confident that there are some steps that we can take that don’t require legislation and that are within my authority as President. And where you get a step that has the opportunity to reduce the possibility of gun violence then I want to go ahead and take it. THE PRESIDENT: Well, I think, for example, how we are gathering data, for example, on guns that fall into the hands of criminals, and how we track that more effectively — there may be some steps that we can take administratively as opposed through legislation. As far as people lining up and purchasing more guns, I think that we’ve seen for some time now that those who oppose any common-sense gun control or gun safety measures have a pretty effective way of ginning up fear on the part of gun owners that somehow the federal government is about to take all your guns away. And there’s probably an economic element to that. It obviously is good for business. But I think that those of us who look at this problem have repeatedly said that responsible gun owners, people who have a gun for protection, for hunting, for sportsmanship, they don’t have anything to worry about. The issue here is not whether or not we believe in the Second Amendment. The issue is, are there some sensible steps that we can take to make sure that somebody like the individual in Newtown can’t walk into a school and gun down a bunch of children in a shockingly rapid fashion. And surely, we can do something about that. But part of the challenge that we confront is, is that even the slightest hint of some sensible, responsible legislation in this area fans this notion that somehow, here it comes and everybody’s guns are going to be taken away. It’s unfortunate, but that’s the case. And if you look at over the first four years of my administration, we’ve tried to tighten up and enforce some of the laws that were already on the books. But it would be pretty hard to argue that somehow gun owners have had their rights infringed. THE PRESIDENT: Well, as I said, I think it’s a fear that’s fanned by those who are worried about the possibility of any legislation getting out there. Q Thank you, Mr. President. I just want to come back to the debt ceiling, because in the summer of 2011, you said that you wouldn’t negotiate on the debt ceiling, and you did. Last year, you said that you wouldn’t extend any of the Bush tax cuts for the wealthy, and you did. So as you say now that you’re not going to negotiate on the debt ceiling this year, why should House Republicans take that seriously and think that if we get to the one-minute-to-midnight scenario, that you’re not going to back down? THE PRESIDENT: Well, first of all, Julianna, let’s take the example of this year and the fiscal cliff. I didn’t say that I would not have any conversations at all about extending the Bush tax cuts. What I said was we weren’t going to extend Bush tax cuts for the wealthy — and we didn’t. Now, you can argue that during the campaign I said — I set the criteria for wealthy at $250,000 and we ended up being at $400,000. But the fact of the matter is millionaires, billionaires are paying significantly more in taxes, just as I said. So from the start, my concern was making sure that we had a tax code that was fair and that protected the middle class, and my biggest priority was making sure that middle-class taxes did not go up. 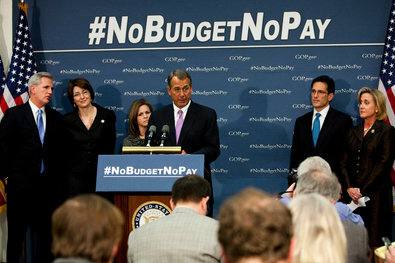 The difference between this year and 2011 is the fact that we’ve already made $1.2 trillion in cuts. And at the time, I indicated that there were cuts that we could sensibly make that would not damage our economy, would not impede growth. I said at the time I think we should pair it up with revenue in order to have an overall balanced package. But my own budget reflected cuts in discretionary spending. My own budget reflected the cuts that needed to be made, and we’ve made those cuts. Now, the challenge going forward is that we’ve now made some big cuts, and if we’re going to do further deficit reduction, the only way to do it is in a balanced and responsible way. The alternative is for us to go ahead and cut commitments that we’ve made on things like Medicare, or Social Security, or Medicaid, and for us to fundamentally change commitments that we’ve made to make sure that seniors don’t go into poverty, or that children who are disabled are properly cared for. For us to change that contract we’ve made with the American people rather than look at options like closing loopholes for corporations that they don’t need, that points to a long-term trend in which we have fundamentally, I think, undermined what people expect out of this government — which is that parties sit down, they negotiate, they compromise, but they also reflect the will of the American people; that you don’t have one narrow faction that is able to simply dictate 100 percent of what they want all the time or otherwise threaten that we destroy the American economy. Another way of putting it is we’ve got to break the habit of negotiating through crisis over and over again. And now is as good of a time as any, at the start of my second term, because if we continue down this path, then there’s really no stopping the principle. I mean, literally — even in divided government, even where we’ve got a Democratic President and a Democratic Senate, that a small group in the House of Representatives could simply say every two months, every three months, every six months, every year, we are going to more and more change the economy in ways that we prefer, despite strong objections of Americans all across the country, or otherwise we’re going to have America not pay its bills. And that is no way for us to do business. Q (Inaudible) — line in the sand negotiating, how is that (inaudible) to the economy? THE PRESIDENT: No, Julianna, look, this is pretty straightforward. Either Congress pays its bills or it doesn’t. Now, if — and they want to keep this responsibility; if John Boehner and Mitch McConnell think that they can come up with a plan that somehow meets their criteria that they’ve set for why they will — when they will raise the debt ceiling, they’re free to go ahead and try. But the proposals that they’ve put forward in order to accomplish that — only by cutting spending — means cuts to things like Medicare and education that the American people profoundly reject. Now, if they think that they can get that through Congress, then they’re free to try. But I think that a better way of doing this is go ahead and say, we’re going to pay our bills. The question now is how do we actually get our deficit in a manageable, sustainable way? And that’s a conversation I’m happy to have. Q Thank you, sir. You’ve spoken extensively about the debt ceiling debate, but some Republicans have further said that they’re willing to allow a government shutdown to take place rather than put off deep spending cuts. Are you prepared to allow the government to grind to a halt if you disagree with the spending cut proposals they put forth? And who do you think the American people would blame if that came to pass? I think that would be a mistake. I think it would be profoundly damaging to our economy. I think it would actually add to our deficit because it will impede growth. I think it’s shortsighted. But they’re elected representatives, and folks put them into those positions and they’re going to have to make a decision about that. And I don’t — I suspect that the American people would blame all of Washington for not being able to get its act together. And in the conversations that I had with Speaker Boehner before the end of the year, we came pretty close — a few hundred billion dollars separating us when stretched over a 10-year period, that’s not a lot. The government is a big part of this economy, and it’s interesting that a lot of times you have people who recognize that when it comes to defense spending — some of the same folks who say we’ve got to cut spending, or complain that government jobs don’t do anything, when it comes to that defense contractor in their district, they think, wow, this is a pretty important part of the economy in my district and we shouldn’t stop spending on that. Let’s just make sure we’re not spending on those other folks. We can achieve that, and we can achieve it fairly quickly. I mean, we know what the numbers are. We know what needs to be done. We know what a balanced approach would take. We’ve already done probably more than half of the deficit reduction we need to stabilize the debt and the deficit. There’s probably been more pain and drama in getting there than we needed. And so finishing the job shouldn’t be that difficult — if everybody comes to the conversation with an open mind, and if we recognize that there are some things, like not paying our bills, that should be out of bounds. Q I’d like to ask you, now that you’ve reached the end of your first term, starting your second, about a couple of criticisms — one that’s longstanding, another more recent. The longstanding one seems to have become a truism of sorts that you’re — you and your staff are too insular, that you don’t socialize enough. And the second, the more recent criticism is that your team taking shape isn’t diverse — isn’t as diverse as it could be, or even was, in terms of getting additional voices, gender, race, ethnic diversity. So I’d like you to address both of those. Now, what, I’ve made four appointments so far? And one women — admittedly, a high-profile one — is leaving the — has already left the administration, and I have made a replacement. But I would just suggest that everybody kind of wait until they’ve seen all my appointments, who’s in the White House staff and who’s in my Cabinet before they rush to judgment. Q (Inaudible) — the big three. And the reason that, in many cases, Congress votes the way they do, or talks the way they talk, or takes positions in negotiations that they take doesn’t have to do with me. It has to do with the imperatives that they feel in terms of their own politics — right? They’re worried about their district. They’re worried about what’s going on back home. I think there are a lot of Republicans at this point that feel that given how much energy has been devoted in some of the media that’s preferred by Republican constituencies to demonize me, that it doesn’t look real good socializing with me. Charlie Crist down in Florida I think testifies to that. And I think a lot of folks say, well, if we look like we’re being too cooperative or too chummy with the President that might cause us problems. That might be an excuse for us to get a challenge from somebody in a primary. So that tends to be the challenge. I promise you, we invite folks from Congress over here all the time. And when they choose to come, I enjoy their company. Sometimes they don’t choose to come, and that has to do with the fact that I think they don’t consider the optics useful for them politically. And, ultimately, the way we’re going to get stuff done — personal relationships are important, and obviously I can always do a better job, and the nice thing is, is that now that my girls are getting older, they don’t want to spend that much time with me anyway, so I’ll be probably calling around, looking for somebody to play cards with me or something, because I’m getting kind of lonely in this big house. (Laughter.) So maybe a whole bunch of members of the House Republican caucus want to come over and socialize more. But my suspicion is getting the issues resolved that we just talked about, the big stuff — whether or not we get sensible laws passed to prevent gun violence, whether or not America is paying its bills, whether or not we get immigration reform done — all that’s going to be determined largely by where the respective parties stand on policy, and maybe most importantly, the attitude of the American people. If the American people feel strongly about these issues and they push hard, and they reward or don’t reward members of Congress with their votes, if they reject sort of uncompromising positions or sharp partisanship or always looking out for the next election, and they reward folks who are trying to find common ground, then I think you’ll see behavior in Congress change. And that will be true whether I’m the life of the party or a stick in the mud. With the economy hanging in the balance, President Obama and House Speaker John Boehner Wednesday tangled over who’s to blame for the “fiscal cliff” standoff and what to do if lawmakers can’t reach a broad deficit-reduction agreement in 27 days. Today, President Obama spoke to members of the Business Roundtable, an association of CEOs of American businesses, and reiterated his plan to extend tax cuts for middle-class families. THE PRESIDENT: Well, good morning, everybody. It is great to see all of you. Many of you I’ve had a chance to see individually or in small groups over the last several months, but it’s good to be back at the Business Roundtable. Jim, thanks for your leadership. Originally, my team had prepared some remarks. They always get nervous when I’m out there on my own — never know what I might say. Given the dialogue that we had the last time, I thought it was useful for me to abbreviate my remarks, speak off the cuff at the top, and then spend most of our time just having a conversation. Let me begin by saying that all of you in this room are not just business leaders, not just CEOs of your companies, but you’re also economic leaders and thought leaders in this country. And I recognize that all of you have an enormous investment not only in your own companies but in the well-being of America. There are a lot of patriots in this room, people who care deeply about not only your bottom lines but also the future of this country. You’ve shown that over the last four years. We’ve gone through as difficult an economic period as we’ve seen in most of our lifetimes, and we’ve emerged not yet where we need to be but we’ve certainly made progress. And the reason we’ve made progress in part has been because of the outstanding management and productivity gains and efficiencies and competitiveness that you’ve been able to achieve in each and every one of your companies. And I’ve said this to some of the small groups, let me repeat it to the large group — I am passionately rooting for your success, because if the companies in this room are doing well, then small businesses and medium-sized businesses up and down the chain are doing well. If companies in this room are doing well, then folks get jobs, consumers get confidence, and we’re going to be able to compete around the world. Now, the good news is that despite the extraordinary challenges that we’ve seen over the last four years, there is progress in some key sectors of our economy. We’ve seen housing finally begin to bounce back for the first time. And that obviously has an enormous ripple effect throughout the economy. Consumer confidence is as high as it’s been. Many of you, over the last two, three years, have experienced record profits or near record profits, and have a lot of money where you’re prepared to invest in plants and equipment and hire folks. I campaigned over the last year on the idea that we need to make sure that this economy is growing and that we’re providing ladders of opportunity for folks — (electricity goes out, feed drops) — I can speak pretty loud. Can people hear me in the back? During the entire campaign, I talked about the importance of short-term measures to boost growth but also a long-term plan to make sure that we’ve got our fiscal house in order, and I called for a balanced and responsible plan. My budget reflects a balanced, responsible plan, and I’ve shown myself willing to make some tough decisions when it comes to government spending — because, despite, I think, my reputation or the reputation of Democrats, I don’t think every government program works exactly the way it should. I think there are efficiencies that can be gained; there are some programs that used to work and just don’t work now the way they were intended. And as a consequence, working with Democrats and Republicans last year, we were able to cut over a trillion dollars of spending — the largest cut, by the way, in discretionary spending in history. So we’re prepared to make some tough decisions when it comes to spending cuts. But if you look at what’s needed in order for us to stabilize our budget, stabilize our deficit-to-GDP ratio, our debt-to-GDP ratio, then every credible economist will tell you that you can’t just do it on spending cuts. We can’t cut our way to prosperity, that there’s got to be a balanced approach in which we also are bringing in new revenues — partly because our revenue levels are as low as they’ve been in most of our lifetimes. And what I’ve proposed, what I put forward in the campaign and what I think a majority of the American people agreed with — in fact, there’s some folks who didn’t vote for me that focus groups and polls show nevertheless they agreed with my concept when it comes to deficit reduction — is that an approach that says we’re going to raise additional revenue particularly from those who have done best in the economy over the last decade, combined with some smart cuts and with entitlement reform that can strengthen our social safety net over the long term but do so in a responsible way — that’s the way to go forward. And that’s what we’ve put forward. Now, the question I think on the minds of a lot of you is how do you get there — because I know that, speaking to many of you privately, you agree with this approach. I’ve been struck by the number of CEOs who said, we’re willing to pay slightly higher taxes if it means that we’ve got the kind of certainty and stability over the long term that allows us to invest and hire with confidence. So most of the folks in this room I think are onboard for a balanced plan. The problem that we had up until fairly recently — and this was extensively debated during the campaign — was the belief that either, A, we could balance our budgets entirely on spending cuts, or a variation that has emerged is, is that we can do so while still lowering rates simply by closing loopholes and deductions. And you’ve heard from my team, but let me just repeat, we don’t have any objection to tax reform, tax simplification, closing loopholes, closing deductions. But there is a bottom-line amount of revenue that is required in order for us to get a real, meaningful deficit reduction plan that hits the numbers that are required for us to stabilize our debt and deficits. And all the math that we’ve done — and we analyzed this stuff pretty carefully — shows that it is not possible for us to raise the amount of revenue that’s required for a balanced package if all you are relying on is closing deductions and loopholes. Let me amend that. It is possible to do, theoretically; it is not possible or wise to do as a practical matter. And the reason is, is that in order for us to raise the amount of revenue that’s needed just by closing deductions and loopholes for high earners, we’d have to, for example, eliminate or severely cap the charitable deduction. And folks in this room, you guys are not only CEOs — I can’t imagine there’s a person here who doesn’t sit on a number of non-for-profit boards, university boards, hospital boards. In your respective communities, you are supporting an entire infrastructure that is the glue that holds our communities together. So the notion that somehow we’re going to just eliminate charitable deductions is unlikely. What that means is, is that any formula that says we can’t increase tax rates probably only yields about $300-$400 billion, realistically. And that’s well short of the amount of revenue that’s needed for a balanced package. So what we’ve said instead is let’s allow higher rates to go up for the top 2 percent — that includes all of you, yes, but not in any way that’s going to affect your spending, your lifestyles, or the economy in any significant way; let’s make sure that 98 percent of Americans don’t see a single dime in tax increases next year, 97 percent of small businesses don’t see a single dime in tax increases next year — and by doing that alone we raise almost a trillion dollars without any adverse effects on the economy. That’s our plan. That’s what we’ve presented. The holdup right now is that Speaker Boehner took a position I think the day after the campaign that said we’re willing to bring in revenue but we’re not willing to increase rates. And I just explained to you why we don’t think that works. We’re not trying to — we’re not insisting on rates just out of spite or out of any kind of partisan bickering, but rather because we need to raise a certain amount of revenue. Now, we’ve seen some movement over the last several days among some Republicans. I think there’s a recognition that maybe they can accept some rate increases as long as it’s combined with serious entitlement reform and additional spending cuts. And if we can get the leadership on the Republican side to take that framework, to acknowledge that reality, then the numbers actually aren’t that far apart. Another way of putting this is we can probably solve this in about a week; it’s not that tough. But we need that conceptual breakthrough that says we need to do a balanced plan; that’s what’s best for the economy; that’s what the American people voted for; that’s how we’re going to get it done. John Engler, who is, I think — he and I philosophically don’t agree on much — (laughter) — no, I’m just being honest about John, and he’s a great politician but he — he originally comes from the other party — but John is exactly right when he says the only thing that the debt ceiling is good for as a weapon is just to destroy your credit rating. So, with that, let me just say we’ve got one path where we resolve this fairly quickly — we’ve got some tough spending cuts, we reform our entitlements, we have modest revenue increases; you get business certainty; you do what you do best, innovate, invest, hire workers, make profits, do well by your shareholders and grow America — and we then have open running room next year to deal with a whole host of other issues like information and tax reform and immigration reform that will further make America, Inc. competitive. That’s one option. The other option is to engage in a self-inflicted series of wounds that will potentially push us back into recession and set back this country, after all the work that we’ve done over the last four years digging ourselves out of a hole. I know the choice I’d like to make. And I think the BRT can be helpful in making sure that everybody here in Washington makes the right choice.